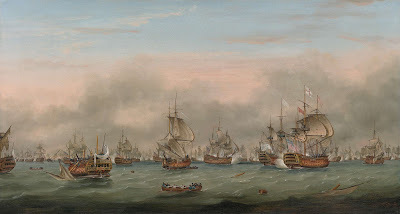 The Battle of the Saintes, Thomas Whitcombe, 1782, Richard Green Fine Art. The defeat of the French fleet under Admiral de Grasse was one of the few bright spots in the otherwise disastrous American Revolutionary War for the British. As such, it was given a prominent place in art. Whether it was a heroic tragedy echoing The Death of General Wolfe, celebrating the capture of Admiral de Grass in historical prints and caricature, the Battle of the Saintes has been depicted time and time again in art of the period. It would eventually be overshadowed by the monumental victories of the Royal Navy in the French Revolutionary and Napoleonic Wars, but in the years of peace that followed America's independence, it was this battle that the Navy could point to with pride. Whitcombe populates the ships with sailors, but we see the vessels at a considerable distance. So there is little we can say about them except that they wear blue jackets. There is somewhat more detail given to the men crowding a small boat in the foreground. The oarsmen are uniformly dressed in shirtsleeves and barge caps, pulling hard. Crowded int he stern are officers and men waving their round and cocked hats in celebration.